This is a quick post of my Theory haul this past weekend. I tried to update my Pinterest board with my recent finds but none of these pieces are available online in the exact color or style. I haven’t been to my local outlet since the end of March and I generally try to stay way from outlet shopping. Every time I go I almost always make a lot of huge purchases on a whim particularly at Theory. 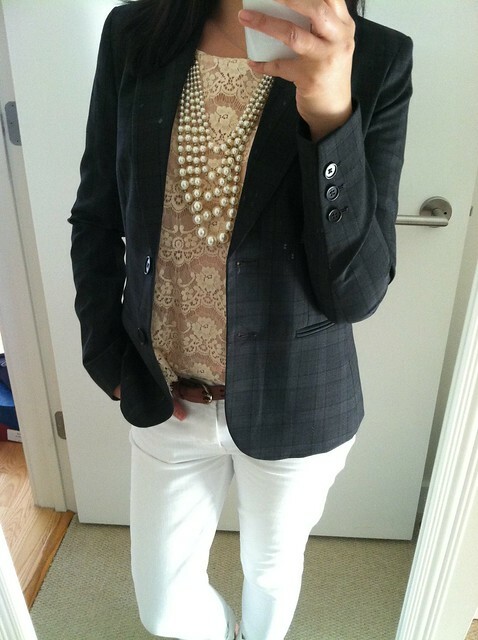 I adore Theory for both the quality and classic fit. At the outlet it’s generally 50% of retail prices (plus 15% off if you spend over $450). Purchasing Theory is definitely an investment even at the outlet’s discounted prices but I feel that the brand is a great value for my personal style. I notice that I reach for my Theory pieces year after year unlike a lot of the other pieces in my closet. 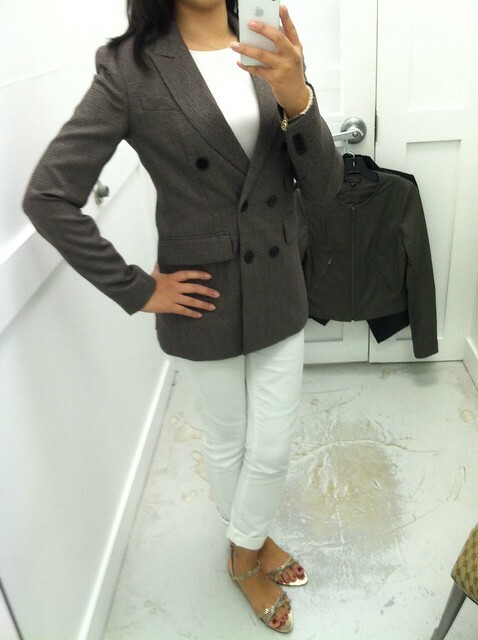 Anyway here are the fitting room pictures I took of the pieces I brought home. If you like any of them then I hope you’re able to snag them for an even a better deal. FYI. I received a email about 20% off $500 now through Thursday (better than the 15% I got off on top of the outlet prices, excludes sale items). Outlets are generally out of the way so good luck to those of you that have time to stop by on a weekday after work. Theory Betty sheath dress (style no. C081608R), size 0. I love the plaid print so much! Theory Nichelle blazer (style no. C081108R), size 0. This is the matching blazer to the sheath dress above. Theory Deronisa silk blouse (style no. C072501R), size P. It’s surprisingly flattering and the vneck is not too deep. Theory Blinn double breasted blazer (style no. C081109R), size 00. I’m wearing it buttoned here but prefer it unbuttoned. Theory Carrian peplum top (style no. 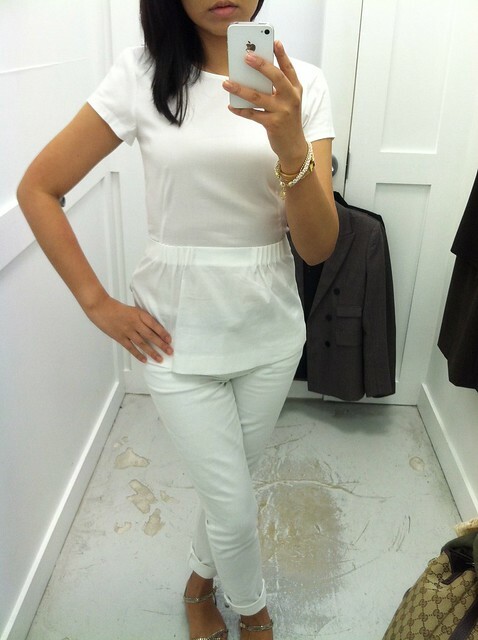 B074540R), size P. I normally shy away from peplum but I’m a sucker for white and the pleated details at the waist. Theory Marandel button up shirt (style no. 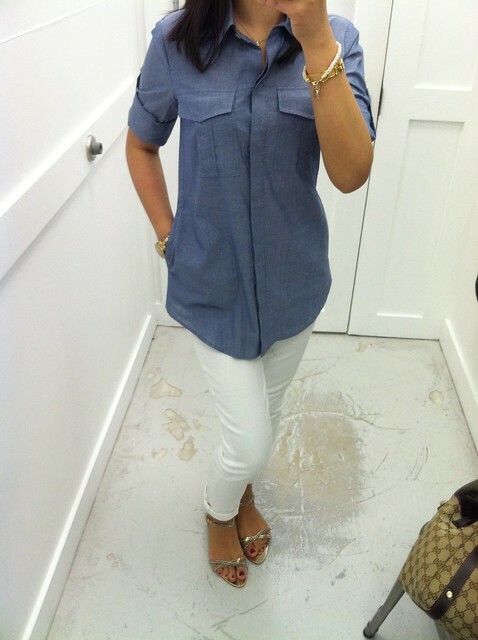 C044506R), size P. I love this chambray shirt and it has pockets as noted by the SA. Thanks Debs!I took that picture at home because it was purchased at the very end. I was ready to check out and the SA was such an enabler. She asked if I knew about the matching blazer to the sheath dress. I couldn't resist because I love the pattern of this fabric so much! Thanks Sheila! 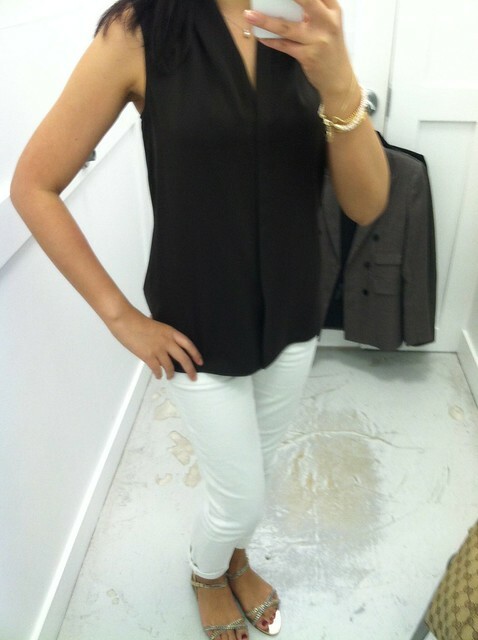 It's my only peplum anything.Heading over to check out your shirt! Thanks Annie! I'm going to stay away from a while again. hehe I wouldn't have gone at all but it was my bf's bday weekend (he got some presents too).